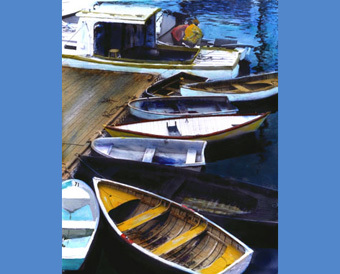 Rowboats at Town Dock at Islesboro, Maine, near the ferry slip. Two lobstermen repair their engine before loading their boat with lobsterpots. Jack paints the print with a loose hand, using Marshall's transparent oils. It's a familiar scene up and down the coast of Maine.